Almost all the valuable items are removed from Seatern: I have a big “grab bag” in which the equipment of any value is removed to my house when the boat is at the jetty. That includes items like the chart plotter/echo sounder, electric outboard throttle unit, tiller pilot and remote, portable VHF etc. Only parts of the radio gear remain on board: (because of the aerial connections) and these are engraved on the back casing with my address as well as being immediately identified if used by the (factory defined) MMSI number and by Smartwater marking. All lower value gear is ID marked: normally in at least two ways including engraving, none peelable labels, and Smartwater forensic ID marking. Items like the anchors are engraved. Tohatsu outboard: Apart from the outboard locking bar, “Seatern” is painted either side of the cowling, and the cowl and engine have my house number and postcode engraved on them (by hand!) as well as being Smartwater marked. Intruder Alarm and CCTV: Seatern has an intruder alarm and the jetty is covered by 24hr remotely recorded CCTV. Additional infra-red flood lighting allows HD images by night as well as in daylight. However the hope is to deter people from breaking in only to find there is nothing worth stealing! This page lists the equipment I fitted or had fitted in Seatern in addition to the standard Swallow Boats fit. In general it describes the state at mid to end 2014 although some notes on updates have been added since. See my “First Year Assessment” for comments on how well the equipment performed. Important Note: the following is simply what I have chosen, not a recommendation. For most of the items I’ve provided a comment on my reasoning and my (very limited) experience to date (about mid 2014). I’m sure that in some cases something better exists, however at present I’m reasonably happy with most of what I have chosen. Much of the gear was bought as one purchase in summer 2013 in order to negotiate a discount, so it represents what was available then. 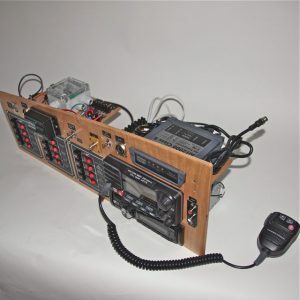 Outboard motor: Initially: Torqeedo 1003 modified to fit the outboard well; remote throttle control and Torqeedo lithium-ion battery charged from the 12v on-board power. Now: short shaft Tohatsu 6hp with high thrust propeller. Ballast pump: Initially: Whale Gulper 220 which proved unsatisfactory and I swapped to a Rule submersible bilge pump lowered through the hatch. Now: a Johnson Ballast Pump for both filling and emptying. Communications: Standard Horizon GX2100 VHF; phone, internet access and TV: Apple iPhone and laptop.